The fairy lilies (Zephyranthes sp.) are starting to bloom. Some people call them rain lilies because they tend to bloom after some rain, but I prefer to call them fairy lilies. I don't know if I read it or dreamt it up, but I think they are called fairy lilies because these are just the type of flowers that the garden fairies are likely to pick and wear for hats. Here in Zone 5, I grow these lilies in containers and overwinter them in my garage. I have two types, this darker rose colored one that I got from my aunt and a lighter pink variety that I bought. 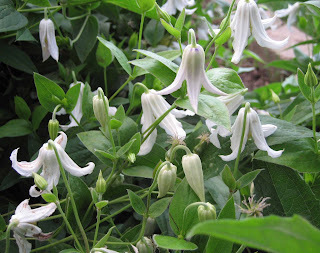 Back to hats... here is my shrub-type clematis, Clematis integrifolia 'Alba'. Those white flowers, with their bell-shape, would also be good fairy hats. However, they are white, so I doubt that any self-respecting fairy wore them before Memorial Day. Those fairies do have some fashion sense. This daylily has a good shape for a hat, but I think it would be a little large for a garden fairy. 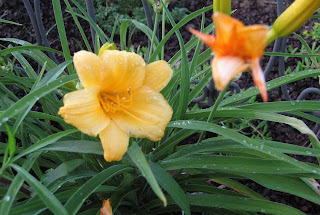 Or let's just say if there is a garden fairy in my garden who is big enough to wear one of the daylilies for a hat, I'd better be a bit more careful about what I say about the garden fairies or accuse them of doing. 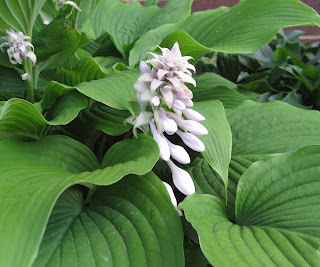 There is one hosta getting ready to bloom; the florets of the hosta bloom could be hats for the tiniest fairies. I'm thinking this hosta is blooming a bit early, but I'm not sure. As spring moves into summer, I tend to get lax in recording when different flowers start to bloom, so I don't have records to refer back to on when the hostas bloom. I do know that I'll have hostas blooming throughout the summer, culminating in the traditional 'August Lilies', which bloom, guess when? These are the hats I wear in the garden. There is no flower big enough for my head, though there have been recent suggestions that I wear a crown of pea vines to commemorate my pea harvest! 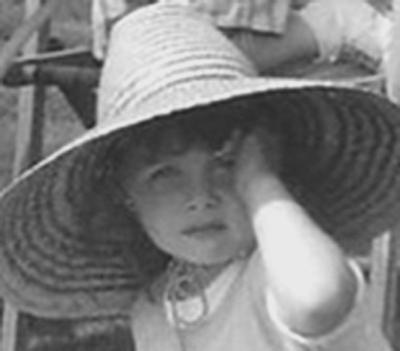 On the left is a traditional wide-brimmed straw gardening hat. It does a good job keeping the sun off of my neck and out of my eyes. I used to think only "old lady gardeners" wore hats like this one, but I'm over that, and I ain't that old. On the right is a ball cap I wear sometimes when I mow the grass. They gave these away for free at Indiana Pacer's basketball games a couple of years ago, if you signed up to be entered into a drawing to be the "Chevy Fan of the Game". I did that half a dozen or more times, so I have a lot of these hats. When one gets dirty, I toss it out and bring out another one. Anymore, if the sun is shining, I'm wearing a hat, it just makes good sense to do so. So what hats do you wear in the garden? Great post! I usually wear my straw hat but today with all the mugginess, I wet a bandana and tied it on and then put my hat over it. It served me well, keeping me cool in the 3pm heat! Ohhh, those clematis are just so lovely, delicate and romantic. What a clever post on hats in the garden! I like to call them rain lilies because they are so symbolic of the happiness we feel in the summer after any rain. 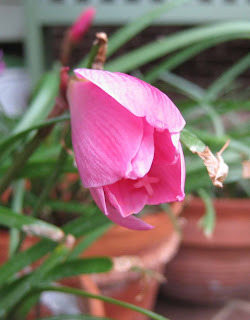 We've had a LOT of rain this year, though, and none of my pink rain lilies have bloomed yet, only the white ones. I wonder if they need to dry out first before they respond to a rain. Never seen a fairy, but I did get a photo of a gnome a while back (and he's wearing a hat). I don't know if I can put a hyperlink in a comment, but look at the April 7 post on my blog to see a real live gnome! I'd say you have a lovely collection of fairy hats, Carol. I'm sure there's one to fit any of your fairies! (I'd check out the purple bench for them). No garden hats for me, unfortunately. I'd love to swan around the garden in a lovely wide-brimmed white straw one with a trailing green sash on it but my head gets too hot as it is. I'd keel over from the heat of a hat. I have yet to find a hat that fits me. 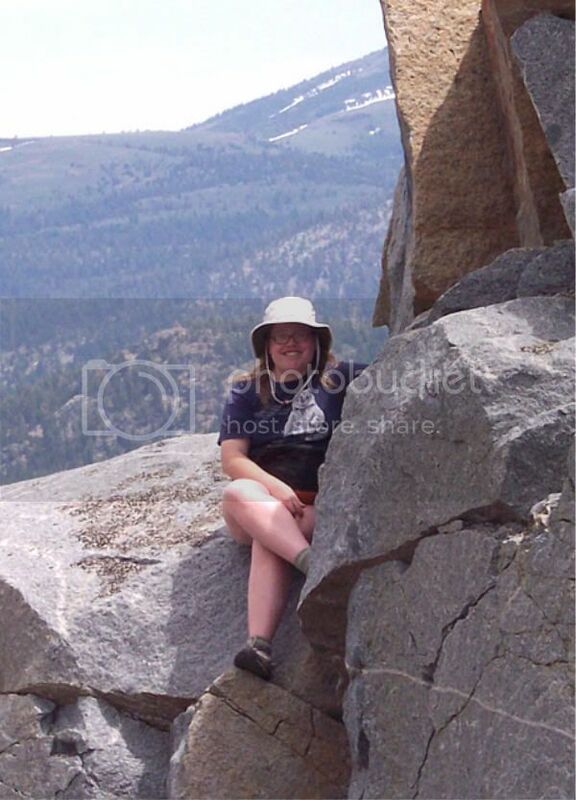 I have a big head and even the bucket hat that I was able to find in size X-Large isn't any too big. So I don't wear hats, and if you could see me in a baseball cap, you'd run and hide, it's that scary. I've got one hosta that's getting ready to bloom, too. None of the rest (and I have quite a few different ones) - just that one. Love that clematis! I've got 'Mrs. Robert Brydon' that I put in last year, so I'm anxious to see what it looks like when it blooms. It's a bush-type, too. I have a few hostas blooming now too, I thought it was a bit early for them to bloom also. I personally don't like the blooms and usually cut them off. Yours however look larger and prettier than mine do. Maybe they get prettier as the plants mature. I usually wear at least a sun visor when I garden, I don't like hat hair, plus my hair is long and thick and hats make my hair smell, you know, that wet dog kind of smell, yuck. I just try to avoid the sun when I work in the yard. Thank you for posting a picture of the white Clematis integrifolia - it's a beauty and I think we need it! As for hats, I'm mourning the disintegration of my cowboy hat ... it was a perfect combination of cool and cool! My faded old RedSox cap works in a pinch though! Many years ago, there was an older East Asian lady in our subdivision who had a beautiful garden. While working outside, she always wore the broad conical hat that I associate with Vietnam. I don't have one yet, but the older I get, the more I appreciate the practicality of it. You are so stylish with your hats! I have several straw hats and several baseball caps but I find that all are too hot so I opt for a visor which keeps the hair out of the face and the sun out of the eyes! I also love that clematis and will add it to my very long list! I usually go hat free because I like to cool off my head with a refreshing blast from the garden hose. If I use the jet setting on the hose nozzle, I also get a nice massage. I wear the same hat I wear every time I go outside from the spring equinox to the fall equinox: a somewhat battered wide-brimmed White Sox hat. My dad's had a couple of skin cancers, so I'm very careful to keep my face, ears, and neck shaded as much as possible. This is the time of year where I'm very grateful for all the shade in my garden! This place may be too hot for faeries, Carol - but I'll keep looking! Hats? My wide-brimmed farmer-style straw hat hangs on a hook on the door into the garage - so when I go through the door, it's handy to grab. I don't work in sun without a hat. They get battered pretty quickly, so I buy a new one every year or so - quite inexpensive and found in the men's department at sporting goods stores. Women's hats are cuter, but men's have a sensible neck cord to keep them from blowing away, plus the brims are usually wider. I also have a couple of wide-brimmed work hats in nylon and poplin, useful when the Divas of the Dirt are working in drizzle. Then there are the garden visiting hats, including my Divas-logo baseball cap worn when walking around in garden centers or nurseries or at Zilker Park. For visiting other gardens, as at the Austin Garden Bloggers Ground Robin, I have a a prettier big straw hat and for fun - a pseudo-Pith Helmet bought at the Botanic Gardens in San Antonio. Dang, that clematis is wonderful. I guess Im not a respectable gardener yet, as I don't wear a hat when i'm gardening. Sometimes though I do wear a bandanna. I have a wide-brimmed, floppy straw hat... and I'm only 31, so I wouldn't say it's an "old lady" thing! I love my hat--it stays in the car so I don't forget it when I work at the garden center or pull weeds in the front bed at my "real" job. Bonnie...I haven't tried a wet bandana beneath my hat. I might try that on the next hot day in the garden. Nicole...Thank you, I'm glad you like the clematis and the post! M Sinclair Stevens... Because my fairy (rain) lilies are in pots on a covered porch with me watering them, they tend to stay wet all the time, but they still bloom. David in Greensboro NC... I did check out your post and saw that gnome. I think they are closely related to garden fairies. LostRoses...I will check around the purple bench some evening at dusk to see if there are garden fairies there! NatureGirl...Thank you for the comment, and I bet your garden is full of fairy hats, too! Kylee...That's too bad about the hats, but keep looking! Robin...Avoiding direct sun is always a good idea. I'd leave the hosta blooms on this year and see if you like them any better. Kris at Blithewold...That's the trouble with hats in the garden, eventually, they do succumb to all the sweat and abuse and have to be replaced. Sue Swift...I also enjoy looking at the pictures of the flower fairies. Entangled...That might be a fun hat to have for the garden! Eleanor...Yes, it is a good idea to leave a few wild areas in the garden for the flower fairies. Layanee...Thanks for the comment, and I think you would like this clematis. Anthony...Yes, when its hot, I think we all like the water from the garden hose! LCShores...Shade is always good. Isn't it interesting that many of us show support for our favorite sports teams with our gardening hats? Annie in Austin...I'd love to see a post of all your hats, it sounds like quite a collection with a hat for every occasion in the garden. Please do keep a look out for garden fairies... they may have adapted to your hot weather. Nickie...I saw your post on your blog that you are going to get yourself an official gardening hat. Can't wait to see it! Blackswamp Girl... Sounds like a very nice hat you have, would love to see it on your blog! Laurie&Chris...A bandana works. My hair is brown and turns red in the sun. You should try to grow your own fairy lilies! All, thanks for the comments, and I look forward to seeing some of your hats on posts on your blogs, too. And don't forget the fairy's hats!